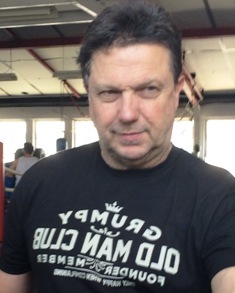 Hi, my name’s Joe and I’m the head coach, owner, mentor, and all-around big cheese here at Joe’s Boxing Club Sydney! My greatest asset is my ability to communicate and mentor my students in the art of competition-style boxing. I’ve spent over 35 years studying various martial arts and traditional fighting techniques, and have come to the conclusion that boxing skills combined with a little Wrestling/Judo or Jiu-Jitsu is the fastest, safest, and most efficient route to effective self-defense. While many martial arts and fighting instructors talk about lethal techniques, for me, if it can’t be practiced in combat I have my doubts if it can be used for real. And even if they can, real sparring and competition is so much more fun than endless practice with imaginary foes. Although I try to keep fit, continue to develop my skills, and still remain active through training and sparring with my students, I have now clocked over half-a-century in man-hours and no longer have a desire to prove anything to myself or anyone else. I am now a teacher, coach, mentor & friend to my students. Prior to owning Joe’s Boxing, my competitive career was, for the most part, spent competing in karate tournaments via which I won national titles and competed internationally. I would have loved to represent my country in the Commonwealth or Olympic Games but didn’t represent the flag because my chosen sport was not eligible. That’s why, even if most of my students will not compete, I want those who truly have the talent to know no limit in their training or potential. And, the reality is, there is no payoff in combat sports comparable to what can be earned in boxing. However I want my school to be for everyone, competitors are expected to help others and we all share victories and defeats. All students are treated equally whether you’re a man, woman, or child, and we all work as a team. Respect and humility are the most revered qualities here. I have a couple of special passion projects outside the gym. One is the love of rural NSW, owning properties in Rylstone & Bourke where projects are afoot to develop retreats, outback adventure tourism trails, and schools to help indigenous kids, to find out more or to become involved ask me. And I’m also involved in helping kids with Autism and Depression.